The Swiss designer Max Bill, who died in December 1994 at the age of 85, fulfilled the multidisciplinary principles of his mentors at the Bauhaus, where he had been a student, in a long career as architect, painter, sculptor, industrial designer and writer. It was for his pioneering work in graphic design and exhibition design, though, that Bill first achieved international recognition. In his 20s, unable to find architectural commissions, he designed posters, brochures, books, trademarks, technical literature and advertisements which helped to lay the foundations of the emerging ‘Swiss typography’. Bill took up Theo van Doesburg’s concept of a ‘Concrete Art’ based on mathematical systems, geometry and the grid. In the post-war years, his purist anti-individualism and emphasis on machine production as the basis of a harmonious functionalism that ‘clearly corresponds to the technical and artistic possibilities of the age’ led to a famous clash with Jan Tschichold in the pages of Schweizer Graphische Mitteilungen. Bill, concerned by Tschichold’s renunciation of the New Typography, reasserted the rationalised production methods of Modernism; Tschichold replied by pointing out their cost to the worker’s humanity. As co-founder and rector of the enormously influential Hochschule für Gestaltung in Ulm from 1951-56, Bill continued to espouse a systematic approach to design. Bill’s best-known graphic designs, such as the 1931 ‘Negerkunst’ exhibition poster, based on the relationship of a square and a circle, are austerely monumental. 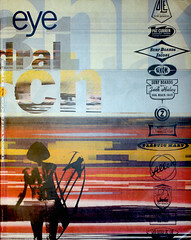 But a two-colour brochure for the medical supplier Wechlin-Tissot & Co of Zurich, designed ca. 1938, with photography by his wife Binia, reveals a less formal side to Bill. Successive spreads of the 24-page, saddle-stitched publication show trolleys, operating tables, surgical instruments, microscopes, laboratory equipment, bandages and X-rays. Bill divided the wide 210 mm x 98 mm page into shifting areas of text and image, light and dark, and signalled the purposes of particular instruments by photographs of the organ on which they would be used – mouth, ear, nose and eye. An oval badge, printed in green, is repeated on each page to reinforce the company’s identity and further unify the elements of a fluid design. The front cover shows the building that housed the company on Uraniastrasse. A surgeon’s scalpel-wielding hands operate on the peeled-back façade to expose the showroom inside.